Amid economic uncertainties, businesses want to get more from existing IT assets. But does it make sense from an IT point of view? As the economic uncertainty continues, it is natural for organisations to want to get more from existing assets, no matter what they are. But for IT leaders, does sweating assets for longer periods of time actually make sense? While assets are usually synonymous with inventory, datacentre assets come with an extra layer of complications - they are dynamic rather than static. Most organisations will have a straight-line depreciation model on equipment over a three-to-five year period. So, if a piece of equipment cost £10,000 to buy and was being depreciated over a five-year period in a straight-line model, it would have a book value of £8,000 after year one, £6,000 at the end of year two, £4,000 at end of year three, £2,000 at the end of year four and would be written off at the end of year five. This bears no relation to the actual intrinsic value of the equipment, and even less to the business value of it. A piece of brand new equipment may have lost up to a third of its intrinsic value by the time it arrives on site. The intrinsic value is what someone would pay for it in the open market – brand new equipment has a higher value than second hand, even where the equipment has never even been out of its box. However, over a period of time, the rate of depreciation of an item of equipment’s intrinsic value levels off – even a 20-year-old piece of equipment will tend to have some intrinsic value somewhere in it. In fact, wait long enough and it will become a collector’s item and the intrinsic value will rise again – but this is unlikely to happen with standard commercial equipment found in most datacentres. The business value of an IT asset is more complex. It is based on how well the equipment is doing what the business needs: is it supporting application workloads that facilitate processes adequately? Is it managing to deal with data requests and analysis in a rapid enough manner? The brand new equipment has no business value until it is provisioned, supporting business workloads and helping the business meet its objectives. It will build its business value up through creating a mix of workload and data management. However, at some stage, the capabilities of the equipment will begin to “fall behind the curve” – newer equipment will be so much better at supporting the workloads, such that this piece of equipment is no longer putting the organisation at the forefront of technology - it has now become a constraint on how well the business can operate. But the data that is being created by the applications that are supported by the equipment continues to grow – it’s just that the equipment is preventing the business from gaining the true value from the data. And this is where sweating assets can become a problem. Let’s take the equipment that cost £10,000 with a life of five years but sweat it for an extra two years. The book depreciation doesn’t change – so you now have a physical piece of equipment with zero book value for two years after its lifetime use, which is good, as it doesn’t appear on the books, but is still doing something useful in the datacentre. Its intrinsic value is pretty low, but is still something, so now you have equipment, which, if sold would actually yield a net positive to the bottom line. This means that the equipment has some value even if the books say it has none. The data value is continuing to increase, as the applications dependent on the equipment are still producing increasing volumes of it. However, the business value has gone beyond its peak and is beginning to fall away, and by year seven, may well be plummeting towards negative values. The business cannot gain the speed of access to visibility of value from the data on the equipment – IT is no longer seen as a facilitator; it is a brake on the organisation’s performance. 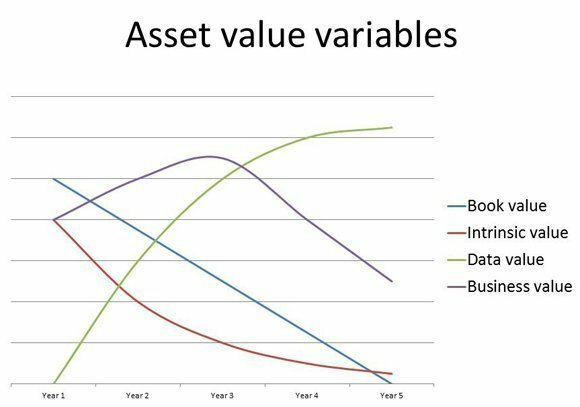 So, sweating the asset has a good look, initially – a book value of zero; an intrinsic value of something – but a business value that is bad. For datacentre professionals to be seen as the “good guys”, sweating assets has to be something to keep away from. The key is to identify the point at which the intrinsic value of the equipment is still high enough for the equipment to be sold off and use the money obtained to invest in more modern equipment. This takes us far beyond IT asset management (ITAM) and whether an asset should or should not be sweated – it gets us into how a platform should be continually optimised to meet the needs of the business. This is IT lifecycle management (ITLM) – and is a strategic direction well worth investigating. ITLM can lead to equipment being replaced on a two- or three-year basis, rather than a five-to-seven-year cycle. 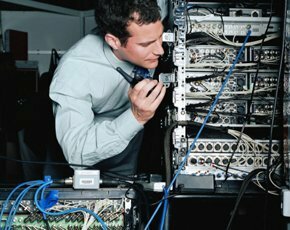 The ongoing IT hardware costs can, and should, be amortised over the periods through financing and it is often better to go to an outside organisation to manage the ITLM process through from initial purchasing through to de-provisioning and secure disposal of old equipment through sale or destruction. Maintenance costs of the total IT estate will be far lower – with equipment being more modern, there will be fewer component failures, and what does fail should be covered under vendor guarantee. Energy use should be optimised – modern equipment has shown over long periods to be more energy efficient year-on-year than what has gone before. Full-service ITLM should not be looked at as just an option – it should be looked at as the future of provisioning and managing IT platforms. The value for IT and, more importantly, the business are strong. Clive Longbottom is service director at analyst Quocirca. Quocirca, the datacentre consultancy firm, has three papers that cover ITLM and IT financing available for free download here: Using ICT financing for strategic gain; Don’t sweat assets, liberate them; and De-risking IT lifecycle management.